Misc » Ever seen a car accident occur? Ever seen a car accident occur? And I'm not talking about the aftermath or a video recording of a car accident (or accidents), but one that you directly saw in front of your eyes in real time. The reason why I am asking this is because earlier today I saw a head on crash occur about 10-15 feet away from me, while I was driving in West Palm Beach, Florida. Here's what happened, I was driving on a 4 lane road with 2 lanes going in the opposite direction and in the middle was a center turn lane. As I was driving along, I noticed to my left a light blue 1996-1997 Toyota Corolla in the center turn lane, getting ready to turn left into a parking lot which would mean the driver would have to cut across the 2 lanes going in the opposite direction to reach the lot. 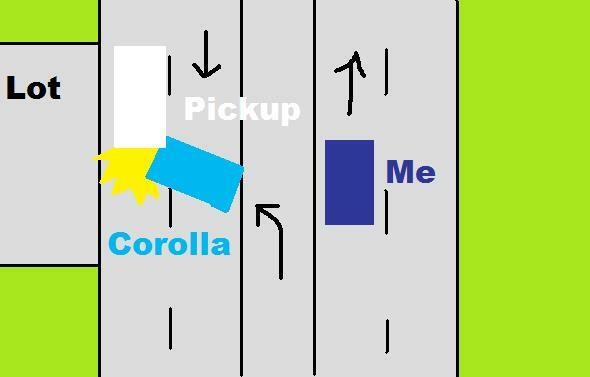 For some reason, I kept an eye on the Corolla as he was turning, and he unwisely pulled out in front of an oncoming white 1999-2006 Chevrolet pickup. My heart jumped when I knew what was going to happen and in no time, they crashed head on as I saw glass flying and the front of the Toyota being smashed like an aluminium can. The crash almost sounded like an explosion. I couldn't help but gasp in horror when I saw it happen. I was so shocked on what just occurred, I just kept driving forward. As I looked at the aftermath of the crash on my rear view mirrors, I contemplated whether I should stop and see if everyone was okay, but there was too much traffic behind me and not to mention I noticed several pedestrians and other drivers were already checking on the accident, so I continued to drive away from the scene as I was still trying to comprehend on what I had just witnessed. Later I heard there were no serious injuries. Even though I lived in the Middle East for 18 years where driving is more chaotic (and I know car accidents happen all the time around the world), I have rarely seen a bad car accident occur on the scene, especially seeing one directly in front of me. I was at turn 1, so I saw it happen right across from me. One of the scariest things, we didn't know James was okay until Alex got him out of the car. Seen a couple of nose to tails, and been ran into my self. What happened to me, the road after the lights went from three,to two to one lanes. (I'm in Australia btw). I was in the middle lane, with the lane on the left ending first. Just as the middle (now left lane) and right merged, a white 97-99 Magna merged across into the rear right of my car. They shouted obcenites at me (as if it was my fault!) and drove off. Did report rego, etc, but got nothing of it. I saw a few accidents, but only minor (less damage than what you seem to describe in the Corolla vs pickup accident). If one occurs in front of me, at least now I have the dashcam. A few days ago I recently nearly got a similar one on the cam : a car turning left, not seeing that a car was coming in front, I saw the accident coming but both stopped in time. Accidents I saw were most of the time the rear car not stopping at time and hitting the car in front, especially in winter when it is slippery. One time there was one indirectly caused by me (but not my fault) : approaching my garage entrance, I slow down, with the blinker, so the car in rear can also slow down safely since there was snow (and here when there is snow traffic is chaotic). At a point I had to nearly stop to turn into the garage entrance, the car behind me slopped properly since he guessed the situation, but the one behind it didn't, so crash. Two times I was the car in front, hit by another one: one time just waiting for turning, the driver behind wasn't attentive enough, could brake to reduce the speed a lot but not enough (I heard the noise of the car tires on the road), no damage to my car, and bumper slightly moved on the other car ; another time just after started to drive from a green light then I had to stop again as the car in front of me was turning right but letting a pedestrian pass, the car behind me didn't notice it and hit my car (but again no damage, very slow speed). Some of which involved me. First one I remember occured a few weeks after I got the licence. I was driving the Berlingo and entered a bend which lead to the highway. It was covered with trees in the middle which made it hard to see what was going on on the other side. Moreover, I did not realise I had to give way. I guess I got distracted as I had gotten lost and was new to the area. As I did not see anyone coming from the right, I sped off - but then a huge truck came out of nowhere and I had to make a hard brake which had the tires gone screeching. It could have been fatal. Next one occured in the Opera tunnel. I tried to get onto the highway, but a semi driving at moderate speed beside me prevented me from doing so. As I ran out of entry lane I had to swerve to avoid collision with the tunnel wall and ended up right behind the truck with only two metres to spare. Then there was one incident which occured off the Sinsen junction. I was heading home from work and as I entered the highway, a black Toyota Land Cruiser which had overtook another car ran into my lane, having me in his blind spot. I had to change lane in order to avoid collision. Last summer I was driving my aunt's Toyota Prius with one of my friends as passenger. After the lights at the junction of Griniveien/Vækerøveien turned green, I had the intention to drive straight across the junction, but a guy driving a foreign-registered dark green Audi A6 Avant had other plans. We were both first in line across from each other and he wanted to turn to his left, which meant that he had to wait until oncoming traffic had made it across. Only he didn't. He ran out right in front of me, and I had to jam on the brakes as I had already gone full speed ahead and didn't see his evil plan until I had gone over the zebra crossings. As I got a brief look at him, I noticed he also had a little kid in the back seat. It was around 1970's when I was a kid. My Mom was taking us to someplace and we were at the left turning lane when I heard a screeching noise. I turned around and saw on the right lane, the old black 1964 Chevrolet was braking. It went past the intersection and hit the station wagon. The station wagon spun around 180 degree and hit another car behind the wagon. The black gentlemen got out of the old black '64 Chevy checking his forehead. We finally got to turned around did not see the aftermath of that old accident in my memory. Two times on the Autobahn: in winter, once there was an Asian in a BMW, I believe it was an E90, who was swerving dangerously due to ice, which caused two cars to crash behind us and he was grinning like the Chesire Cat! The other time was when my dad briefly took his eyes off the road, but he braked the Passat in time, unlike the Toyota Corolla Verso in front of us, which hit a dark blue Mercedes W168. I can still remember the pieces flying off the 'Yota! And finally, on our annual vacation to Denmark, as we were heading to Puttgarden, a VW T5 transporter smashed into the side of our car. Mid seventies, in the way back home after the weekend in the Simca 1100 of my parents. My father lost the control of the car (he was drunk...) and the car finished through the grille of a... cemetery. Fortunately, none of us was injured. For the record, it took ten years and two more accidents (including another -smaller- one with us and one in which he was seriously injured) for my father to quit drinking. He is now sober for 30 years, and never had a car accident again. Nobody hurt seriously. Car get bumpers damage, moto lost mirror. This happened to me a few years ago. Me (red car) and an Impreza at a red light, waiting to turn left. On the cross street, a Nissan Rogue in the left lane decides to make a right turn at the last second, and is hit on the rear corner by an Accord (yes I know the icons are wrong). The speed limit here is 55mph so it was a pretty hard hit. Rogue spins and slams into me and the Impreza, lucky for me the Impreza took the most damage, I guess he was sticking out a little bit more. The Accord ended up in a ditch. Amazingly no visible injuries to anyone. I would guess the Accord driver had some injuries because it was a hard drop into the ditch, but he was walking around ok right after the crash. My car was drivable, only cosmetic damage to the bumper/grille/hood/headlight; the other three cars had to be towed away. The young girl driving the Rogue said "My GPS told me to turn right!" I meant who was considered as responsible ? Both. Biker exceeded speed, car cross the line twice at one time. I wasn't expecting this many responses, and interesting ones too. Although I usually drive carefully and haven't been involved in any accidents (not even minor ones) yet, I did have a few close calls and most of them happened back when I recently got my driver's license and was still a naive driver. Once I was stopping at a T-junction and it seemed both sides were clear, but thanks to the trees on the sides obstructing my view, I failed to notice a Ford Focus fast approaching as I turned left, and soon I heard the Focus braking and honking at me. A similar incident happened when I was at an intersection turning right and got honked at for not noticing that at the same time, a car from the opposite direction was turning left into the same road I was entering. Finally, I once nearly rear ended a Volvo when traffic on the highway suddenly slowed down, and it didn't help I was distracted talking to my brother who was sitting on the passenger seat, but fortunately I was able to react quickly by slamming the brakes on time. Ever since those near misses, it made me drive more cautiously and be more attentive when driving, and that accident I saw yesterday will probably make me even more cautious. P.S. Owlman's sophisticated diagram of the accident he was involved in, makes the one I did look inferior. As far I remember I've seen two crashes... In the same place: the intersection in front of my grandparents house. The first one, I was a kid and I was looking the cars from the kitchen's window. A Renault Super Cinq was about to turn left, but the traffic light was just switched green so it was steady in the middle of the road waiting to turn. In the opposite direction a Fiat Tempra SW just started to go when another car (maybe a Mercedes-Benz W124, but I'm not sure) arrived behind the Renault quite fast and although it braked hard, hit the Renault pushing it against the Tempra. The poor R5 was totaled: rear and front completely destroyed, oil and other liquids everywhere, same thing for the Tempra: grille, headlights and bumper heavy damaged, but the Mercedes had just the plastic of an headlight broken and the bumper scratched! The following days I found on the side of the road the Tempra's Fiat badge of the grill. The other one was 8-9 years ago; an old man on a bicycle was hit by a man in an Opel Zafira, but at low speed so no serious injuries although the old man fell from the bike and hit the ground with the head (in fact he was unconscious). Always in the same intersection a lot of other accidents happened, according to my grandparents tales, the more impressive ones: in the early 90's a Renault 5 had lost control after a hump and collided with the gate and a piece of wall destroying them. A tow truck carring a broken-down minivan waiting at the red for turn right, was rear ended by a truck that pushed it against a light pole, then to the traffic light pole, some signals and even a electrical unit (causing a small blackout); both poles fell in my grandparents garden, luckly there wasn't none at the moment, but there were pieces of glass and plastic everywhere! A Ford Ka made about 3-4 rollover after being hit by another car while merging on the main road, and many others! so just a short on-topic comment. I've seen a plenty of accidents (in a few I was also involved...) that I cannot remember them all. The first one, I remember was in the mid-70ies, when I was a small boy. In the wee village, where my grandmother lived, a neighbour-girl teached me riding bicycle (yes. ) A friend of her stopped in his Simca 1000 to ask her something - then annother fellow smashed with at least 50 km/h smashed into the Simca with his Opel Ascona A. Nobody was injured, but both cars were totaled. The high score about this topic is hold by my wife. At one day on the way home (terrible 70 km from Duesseldorf to our village mostly via the terrible Autobahn A3) she had witnessed three accidents. So two times she could tell the bewildered Autobahn-cops "Hi, me again"
Now the dryer is finished and me tired. So two times she could tell the bewildered Autobahn-cops "Hi, me again"
wasn't she suspected of causing them, at the end? I saw my own Crash - of course. Head on collision Audi A6 versus BMW 3 Series (E36). Our vehicles looked like noone could survive this but the Audi Driver had only minor injuries. I had a lung contusion, broken femur, broken Hand and ruptured finger tendon. From Third-Person view i didnt saw a Crash yet. But when i was on vacation in the USA going northbound on I-95 near Rockledge, Florida on a truck going the opposite direction blew a tire just in the moment it was passing me. The Blow was so loud and so Close that i first thought it was the tire of my own car. I've witnessed two serious accidents in just the past few years that I actually ended up having some involvement in. One was an SUV spinning out and rolling over right in front of me. It was incredibly surreal. I placed the first 911 call for that one. The second was a chain reaction between 4 construction pickup trucks in the lane right next to me. The first three stopped for traffic, the last one kept going full speed ahead. It had a utility body and was towing a compressor. The result looked like an accordion. I stopped and pulled the driver of the responsible truck from the window. His leg was broken. I do not wish to go into further detail. I hate reliving the images of both. Last year while in Seattle, some friends and I were stopped at a light. Out of nowhere, we see a dump truck plow into a compact car and push it a few yards down the road. Before we could react, we were rear ended by a drivers ed student. Nothing serious but it was just a weird chain of events.